The Swedish manufacturers resurrect a long-gone studio classic. The war of the clones appears to be picking up pace: every month, it seems, we’re greeted by a new homage to some classic piece of gear, and increasingly these are made available for a fraction of the price of the model they imitate. Golden Age Project (GAP) set out along this path several years ago, with the launch of their Pre-73 (http://sosm.ag/gap-pre73), and later the Pre-73 DLX, EQ-73 (http://sosm.ag/gap-pre73dlx-eq73) and the Comp-54 (http://sosm.ag/gap-comp54), all of which were based on classic designs by Rupert Neve, and they’ve since offered 500-series variations on those themes. 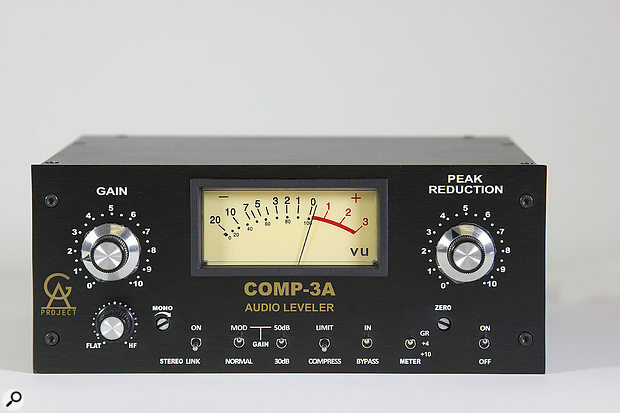 The latest addition to their stable is the Comp-3A which, as the name implies, is GAP’s take on Universal Audio/UREI’s popular Teletronix LA-3A. This compressor has already seen one reissue made by Universal Audio come and go, and although it’s not currently in their product range, they still offer an analogue modelling plug-in version for their UAD DSP platform. Before we get on to the Comp-3A, it’s worth spending a few words discussing the processor which inspired it. The LA-3A can be thought of, in very broad terms, as a hybrid device which marries the LA-2A’s optical compressor stage and user controls with balanced solid-state input, output and gain stages akin to those of the same manufacturer’s 1176 FET compressor. In the LA-3A, audio input and output transformers are used, and a 1:10 line transformer steps the signal up before the optical cell. As you’d expect, given the optical cell, the compression action is similar to that of the LA-2A, but there are differences due to the surrounding circuitry. Specifically, the LA-3A responds rather faster to loud transients — there’s very little difference between the two when it comes to lower-level transients, or in the compression action after that which is triggered by the initial loud peak. Gain-reduction aside, the overall sonic character, particularly when driven into distortion, is rather different; there’s a sort of bright-sounding distortion to the LA-2A when pushed, probably courtesy of its tube stages. That has its uses, of course, but it doesn’t suit every source. To my ears, the LA-3A instead pushes the low mids forward somewhat. It’s nothing too dramatic unless you really overdo it — I can best describe it as obvious but also natural. What it isn’t is an LA-2A sound! The Comp-3A is intended as a faithful recreation of the LA-3A, but GAP have nonetheless incorporated some useful operational tweaks. Most obviously, they’ve chosen to locate all the LA-3A’s rear-panel controls on the front, which makes a lot of sense, and they also seem to have incorporated the most popular modifications made to the original units, which were included in Universal Audio’s own reissue. (More on those below.) We’re treated to a classy-looking black, brushed-aluminium front panel, with screen-printed gold logo and product name, and white control legends. The only nod to the livery of all their other preamps and processors I’ve seen to date is revealed when you lift the lid: the red and gold of old is proudly displayed on the GAP-branded T4B optical cell. The device runs on 24V AC power, either from the included line-lump PSU or from one of Golden Age’s separately available stand-alone half-rack power supplies, which can power several of their units at once. The Comp-3A’s power inlet is on the rear, and so too are the audio inputs and outputs, which are helpfully paralleled on XLR and jack (note that you shouldn’t use both at once), and there’s a TRS jack Link socket there too. The Comp-3A accepts an external power supply delivering 24V AC — there’s an included line-lump PSU, but Golden Age Project also offer higher-quality standalone power supplies. The front panel is, compared with the original LA-3A (and the UA reissue), laden with controls, yet it still manages to remain uncluttered and intuitive. The (output) Gain and Peak Reduction (threshold) controls are joined first by a side-chain filter, which makes the gain-reduction circuit less responsive to low frequencies (and more to mid and high ones) the further clockwise you turn it. Next comes a stereo-link facility, which it’s great to see is accessible on the front. I didn’t have a second unit to test this, but the theory is that you connect the two units via a TRS jack cable plugged into the rear of each, then switch the stereo-link facility on via the front-panel switch. Finally, using a small flat-head screwdriver (or my Swiss Army Knife or some similarly flat-pointy gadget...) you can turn the recessed Mono trim pot to set the desired blend of side-chain control voltages from each unit: fully anticlockwise on both gives you true stereo compression, preventing any problems with the signal flickering across the stereo field; fully clockwise results in a dual-mono behaviour; and in between gives you... well, something in between. Just be sure to set both units to the same behaviour and to set things by ear rather than eye, and all should be fine. As on the original, the user has a choice of two ratios, Compress (4:1) and Limit (10:1), but having this switch on the front panel makes a lot more sense. The meter can be set to display GR (gain reduction — there’s a trim pot to calibrate this), or output at two different reference levels. Along with a hard-wired bypass, this makes gain staging and in/out comparison easy. An interesting and very useful feature is the gain-modification facility, which comprises a pair of toggle switches. The first selects between ‘Normal’ and ‘Mod’ gain settings; and the second between 50 and 30 dB. Normal is obviously the original factory implementation. Mod is a modification of the LA-3A which is often attributed to A-list producer Bob Clearmountain (though it’s only fair to give at least some credit to Ed Evans, the chief technician at the Power Station studio where Clearmountain worked!). Again, this facility featured on UA’s reissue, but was located on the rear; here it’s on the front. Setting the first switch to Mod reduces the output gain by 24dB. Setting the second switch to 50 compensates for this lower gain. In practical terms, this combination serves to reduce both the unit’s noise floor and the compression threshold, thus enabling you to dial in rather more gain reduction. Hooking up the Comp-3A to my DAW, I installed it as an ‘external effect’ and used it on a number of sources from a mix I’d recently completed, comparing it with a couple of software emulations of an LA-3A along the way. It performed admirably, offering a wonderfully natural-sounding compression on male lead vocals, while at the same time thickening the sound somewhat. I wouldn’t call it subtle, exactly, as you can hear that it’s there and doing something, but it’s not an intrusive sound; quite the opposite, in fact. If you’ll pardon the cliché, it really does make things sound that bit ‘more like a record’. The Comp-3A sounded wonderful on some well-played electric and acoustic guitar parts. The transformer thickening effect always seemed to make things sound more pleasant without compromising the overall tone at all. Keyboards (I tried it on Rhodes and a couple of synth parts) benefited similarly, and bass guitar was usefully and smoothly brought under control. I could go on, instrument by instrument, praising the sound of the compressor, but there’s little point, as it was effectively the same thing happening every time — a nice, unobtrusive, yet thickening warmth coupled with the optical cell’s firm yet apparently effortless control. The front panel is rather busier than Universal Audio’s LA-3A reissue, as Golden Age felt that various functions on the rear would be more conveniently located here. The only thing to say is that it’s not necessarily the best pick for all jobs: though very fast for an optical compressor, it’s not that fast compared with, say, a modern VCA design or even a FET one, so this isn’t the toy to turn to when you want to bring the spiky transients of a wayward guitar performance under control; that’s a job done better in software these days, in any case. The absence of user controls for the attack and release times mean that it’s not my favourite compressor for modern drum sound either. But where it works, it works beautifully. Incidentally, if you really want to focus on what’s happening with that gain mod, and why it became so popular, you could do worse than run a gated snare-drum through it. I’d done that more out of curiosity than anything, just to see what sort of character it lent to the sound (in case you’re interested, the thickening effect was useful enough, but the compression action less so) but this test revealed the noisier performance in Normal mode quite obviously. For all this talk of sound, though, the thing that most demanded my attention was just how quick and easy it was to achieve the desired results — which is something I value more and more every day I track and mix. I found myself using the Comp-3A with the Mod and 50 settings most of the time. With those settings engaged, I was happy to close my eyes (something that’s much harder to do with software or even the rotary encoders of a control surface) and juggle the Peak Reduction and Gain make-up as I judged the results by ear. Does it sound like an LA-3A? Although I’ve used the ‘real thing’ in the past, I’m afraid I didn’t have one to hand during my review tests. However, I did have the Waves and UA plug-in equivalents, so I compared it with those. I found that, using the software versions, I was able to get very close to the same settings. In terms of the gain reduction, the plug-ins were probably a tiny bit faster acting — just a hint more grabby. But I much preferred the tonal contribution of GAP’s Comp-3A. But the biggest difference was that with the software it just took me that much longer to arrive at a sound I was happy with, and that alone makes hardware like this appealing. The fact that it costs only about the same as a couple of decent plug-ins makes it even more so! What about downsides? Well, as a reviewer I’m duty bound to hunt for them, but I really did find myself scratching in the dust. All that I can offer you is that the line-lump PSU won’t please everyone (but then GA offer a separate PSU), and that it might have been nice to include a wet/dry mix control to make instant parallel compression possible. Neither of these are important points, and they would certainly not deter me from acquiring this unit for what is a fraction of the asking price for a used LA-3A. What all this boils down to is that this would make a great, affordable tracking compressor. You have to work really hard if you want to make it screw things up, and although it’s clearly doing something nice to the signal it’s not something you’re ever going to think is really wrong (unless you’re working in a purist genre where you wouldn’t really want compression at the recording stage in the first place). It would make an equally wonderful mix tool too, and would be great as a go-to vocal or bass-guitar compressor in particular. It represents great value and I highly recommended it. Apparently they have an LA-2A tribute in the pipeline too: I can’t wait to try that one! As far as I can tell, Universal Audio’s own reissue of the UREI LA-3A has now been discontinued, though they do offer a plug-in model of it for their UAD platform. They also still offer the Teletronix LA-2A, at whose heart lies the same T4 opto cell, and there are quite a few ‘covers’ of that processor by other manufacturers. Antony Demaria Labs’ Opus-3 is a similar recreation to the Comp-3A, complete with gain mods and slightly different specs, but it costs rather more. Solid-state departures from the LA-3A design, but still offering optical compression, include the Grace Design M102, the various Joemeek units and plenty of 500-series modules, including JLM Audio’s LA500 and LA500A, IGS Audio’s LA4-inspired Photon 500, Buzz Audio’s Essence, and the PWM-driven MC AudioLab OC1. Popular modifications treated to front-panel controls. Looks as classy as it sounds. Audio I/O on both jack and XLR. In-line wart PSU won’t please everyone. A far classier implementation of a classic optical compressor design than it has any right to be at this asking price!